August 2nd, 2009. The Ghawi and Hannun families of Sheikh Jarrah in East Jerusalem are waking to the sounds of police and trucks and movers. In a few hours, their houses will have become the home to settler families, and they will be kicked out to the street. Those images are flashing back to me as I think of what could happen in two weeks in Silwan. We’ve seen those pictures in the past: Palestinian family – out, Israeli settlers – in. Sometimes the house is legally bought by the settlers; sometimes it is the implementation of the “right of return” to properties that belonged to Jews before 1948 (like in the case of Ghawi and Hannun); and sometimes it is because the Israeli Authorities decided to use the Absentee Property Law in order to take over the Palestinian house and give it to the settlers. The Sumarin family has been living for decades at the entrance to the Wadi Hilweh neighborhood of Silwan, not far from Al-Aqsa Mosque. Two months ago, the court scheduled their eviction for November 28, 2011 in a ruling handed down in the absence of defense by the Sumarins. Their house is considered by the authorities as a property of an absentee, and therefore, it was transferred to the hands of the Himanuta company which requested the eviction. For the last 20 years the Jewish National Fund has been acting to transfer Palestinian property in East Jerusalem to the settlers. Tens of dunams of land and homes housing dozens of Palestinians in Silwan were evacuated by the JNF through various legal proceedings and transferred to settlers from the Elad organization; In many cases the JNF does this through its subsidiary Himnuta, whose shares are held by the JNF. In the 1980s and early 1990s, dozens of properties in Silwan were declared absentee properties and sold to the Development Authority. According to the law, the Development Authority and the Israel Land Administration are required to administer their assets equally without discrimination based on nationality. Conversely, the JNF and Himnuta operate according to a JNF memo that provides that its assets be leased or transferred to the possession of Jews only. In order to bypass the requirement of equality, the authorities in the early 1990s used the JNF and Himnuta to transfer property in Silwan to the settlers. On May 23, 1991, a barter deal was signed between the Development Authority and Himnuta, according to which the Development Authority was to transfer 30 dunams of absentee property in Silwan to Himnuta in exchange for land it owns in the Wadi Ara area. The purpose of the deal, as defined by the director of the land Department in the JNF and Himnuta, was “for those properties to be under Jewish ownership.” Later some of the properties were leased to the Elad settler organization without a tender. Most of the properties were inhabited by Palestinian families that did not even know that their homes were declared absentee property, sold in a barter deal to Himnuta and leased to settlers. Himnuta began demanding the Palestinian tenants be evicted from their homes through legal actions. Among the properties transferred in this way to Elad are Beit Hamaayan (“the well house”), which serves as a tourist and archaeological excavation site, and Beit Hatzofeh (“the lookout house”), which serves the organization as part of its tourist site and visitors center as well as serving as a settler residence. Properties had been systematically allocated based on criteria that violated the principles of equality, and contrary to rudimentary procedures. The settler organizations located the properties they were subsequently to receive from the State, based on affidavits which they themselves arranged and confirmed. The Custodian of Absentee Property failed to exercise even minimal discretion. No tenders had been issued, and it was the political echelon of the Ministry of Housing which instructed which organization would receive which asset. Following the Klugman Report, the machine that was established in order to assist the settlement at the heart of Palestinian neighborhoods in East Jerusalem was stopped. However, some of the procedures that started at the early 90’s, continued. To this day, Himnuta continues pursuing legal claims against Palestinian residents based on the barter deal from 1991. At least three families in Silwan are at risk of eviction after years of long and expensive legal proceedings that have not yet ended. The Sumarin family is one of them. 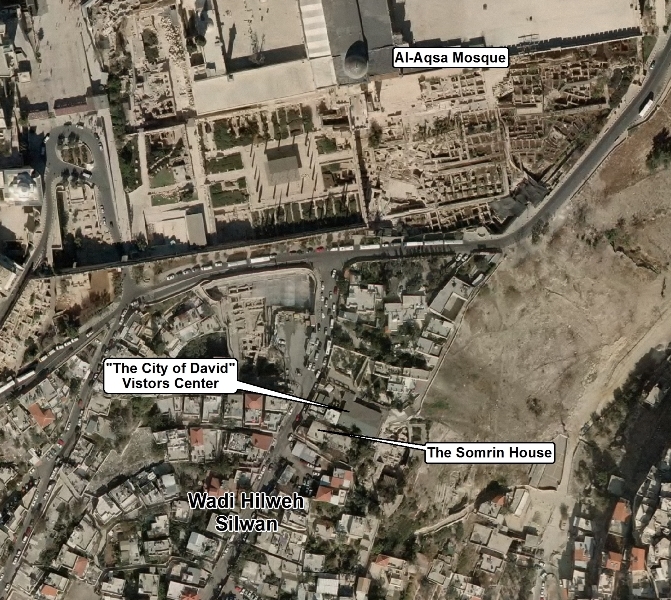 The settlers built the visitors center of the “City of David” tourism site next to the Sumarin family’s house. Therefore, the house is a strategic site for the settlers that would give them a large contiguous area at the entrance to Silwan and dramatically change the neighborhood. For me as a Jew, I feel ashamed that Himnuta and the JNF, that are claiming to act in the name of the Jewish people, are continuing to this day to use their organization in order to kick out Palestinian families from their homes and to bring in Jewish families instead. This is not only politically wrong and dangerous, but it is also immoral. Himnuta can decide, instead of giving the property to settlers, to give it to the Palestinian family that has lived in it for years. The Israel Police can decide not to assist in the eviction of the family and to prevent it. The police has avoided evicting settlers from Beit Yehonatan in Silwan for more than three years, even though the court has repeatedly ordered it to evict them. The attorney general has asserted on different occasions that if the police believe there is a threat to public security it must prevent right holders from realizing their rights at that time. It is now our role to try to put pressure on the JNF to stop the procedures against the Sumarins, and on the Israeli government to prevent the provocation in Silwan. This entry was posted on Wednesday, November 16th, 2011 at 1:58 am and is filed under Uncategorized. You can follow any responses to this entry through the RSS 2.0 feed. You can leave a response, or trackback from your own site.